The state of water resources varies greatly around the globe. 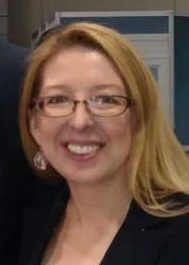 Innovative water treatment technologies, green infrastructure, and improved management approaches can help change the current paradigm, allowing stormwater, municipal wastewater, and other ‘post-use’ water to be valued as a resource for fit-for-purpose water reuse, energy, nutrients, metals, and other valuable substances. 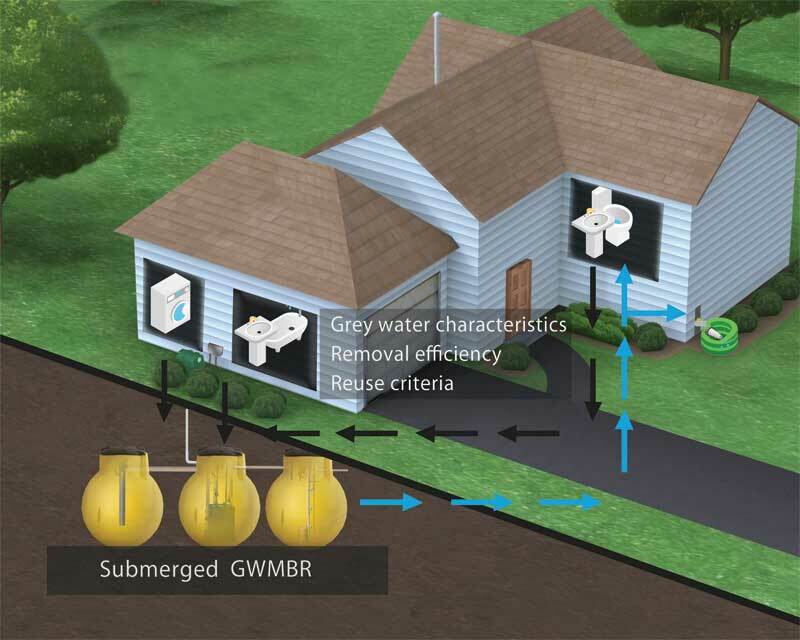 A ‘water-resource-recovery’ strategy utilizing onsite greywater recycling can provide not only efficient irrigation, runoff mitigation, and pollution prevention for individual buildings, but also both economic and environmental benefits to larger communities. On a smaller level, greywater recycling systems can help property owners substantially reduce their building’s water consumption. Although the water going down the drain is not potable, it can still be useful for other purposes. Greywater recycling systems are specifically engineered, and extensively proven and tested, to collect the used water from showers and baths, filter and disinfect it, and then plumb it straight back into toilets, washing machines, or outside taps. Capturing water from a five-minute shower allows a toilet to be flushed up to 10 times—up to 19 L (5 gal) of water used per minute. (For more information, see “How much water does the average person use at home per day?” from the United States Geological Survey [USGS] Water Science School’s “Typical water use at home” reference table.) At the current rate, one’s water bills are expected to double in the next decade. The U.S. Environmental Protection Agency (EPA) estimates that about 25 percent of indoor household water is used for toilet flushing. Showers/baths and washing machines can be around 20 percent each of total indoor water usage. Sinks, leaks, and other water activities make up the remaining amount. For those employing treated greywater, this gives an annual average water consumption savings of more than 34,070 L (9000 gal) per person. Wastewater is defined by NSF/ANSI as human body waste and liquid waste generated by the occupants of an individual residence. Wastewater is also generated from any facility occupied by humans. Wastewater can be subdivided into blackwater and greywater sources. Blackwater is the portion of wastewater from a residence or facility generated by toilets, urinals, bidets, kitchen sinks, and dishwashers. NSF/ANSI defines greywater as wastewater from water-bearing fixtures, including laundry—such as clothes wasters and laundry sinks—and bathing, such as bathtubs, showers or sinks, but excluding toilets, urinals, bidets, kitchen sinks, and dishwashers. Untreated greywater contains significant to trace amounts of soaps (e.g. body wash, shampoo, liquid hand soap, and bar soap), detergents, lotions/conditioners, cleaners/cleansers, dirt/particles, toothpaste, and deodorant, among other things depending on the activities of the occupants. It should not be stored for long periods—no more than 48 hours—as pathogens can quickly breed. (The volume of water used to flush toilets closely matches the volume of greywater produced in a day from bathing. This allows for a smaller tank size since all the greywater generated is used that same day. For more information, readers can visit nwdistrict.ifas.ufl.edu/nat/files/2017/06/Residential-end-use.png.) If greywater is collected, for example by washing up in plastic tubs, or bucketing out of a bath, it should only be emptied directly onto soil, not onto plants. It should also be put on different parts of the garden in rotation, to avoid a buildup of salts that damage the soil. With greywater recycling systems, the water is purified through several treatment processes to a level safe for a variety of beneficial uses. A number of regulatory agencies have adopted requirements that must be followed when producing, distributing, and using recycled water. Water quality is strictly monitored and routinely reported to the respective Regional Water Quality Board. The resulting highly treated effluent can be used for irrigation of landscaped areas, water features/fountains, and dust control. Such applications not only help conserve natural resources and protect ground/surface water, but also enable buildings to overcome land constraints. The first stage in filtering greywater is to remove large particles (e.g. hair and lint) through using a cloth bag or old stocking to prevent clogging of the next filter. (Kitchen water should pass through a grease trap first.) This can occur using several different types of decentralized technologies. Wastewater treatment is a complex process that demands a combination of solutions, rather than a one-size-fits-all approach. All septic systems require oxygen so bacteria can properly convert complex molecules into basic ones like carbon dioxide (CO2), water (H2O), and nitrogen, as well as eliminate viruses like E. Coli. Therefore, the major difference between the tertiary systems is how the oxygen gets to the bacteria. Some pump air into the sewage, while others put the sewage into an area with oxygen. 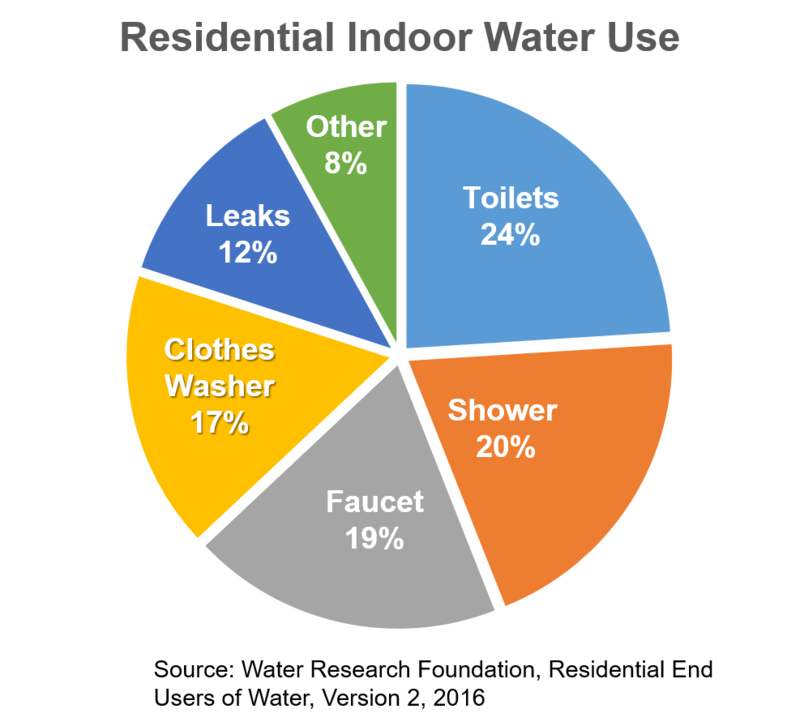 With residential projects, all daily flow calculations start with the number of bedrooms and an approximation of water use for each person, but this is not the case when it comes to other factors. Other considerations include terrain/soil site conditions, along with the fixtures used—including the types (low-flow, high-efficiency, or not) and number of washers (dish/laundry), faucets, showers, tubs, and floor drains used or installed on the premises. Whether it is for toilet flushing, onsite irrigation, or for cooling towers, reused water must meet the applicable local code for its intended use. For most advanced treatment systems, whether they are integrated fixed-film activated sludge treatment, trickling filter systems, extended aeration systems, or onsite membrane bioreactors (MBRs), the technology easily scales up to accommodate the flows between small-scale packaged systems (as low as 1-m3 [35-cf] daily flows) and full-scale wastewater treatment plants (beyond 600 m3 [21,190 cf]). Each system has a slightly different setup, depending on the site conditions and the level of maintenance willing to be undertaken. MBRs (ultrafiltration)—membranes and aeration process act as an impenetrable physical barrier to produce water filtrate that is 99.9 percent removed of pollutants. Residential and commercial blackwater and greywater recycling systems have entered the U.S. marketplace with continual support from certifying bodies like NSF International, PIA GmbH, and the U.S. Environmental Protection Agency Environmental Technology Verification (EPA ETC) program—third-party agencies that review the technologies with testing and provide certification to global safety standards. NSF establishes criteria to improve awareness and acceptance of water reuse technologies that reduce impacts on the environment, municipal water and wastewater treatment facilities, and energy costs. Onsite MBRs certified to NSF 350, Onsite Water Reuse, dramatically simplify the settling, screening, direct aeration, and ultrafiltration of the wastewater treatment process to remove 99.9 percent of the contaminants and result in high-quality effluent. The treated wastewater from an MBR can be used for restricted indoor water use and/or unrestricted outdoor water use. Such membrane bioreactor systems can be suited for water reuse applications due to the low-flow, durable, flat-sheet membranes that use micro-sized pores for physical separation of solids from the wastewater. These systems also meet water quality requirements for the reduction of chemical and microbiological containments. They typically have a recirculating feature to aid in nitrate removal. This decentralized treatment system offers lower costs than centralized sewering, and is often ideal for single homes or small communities. Proprietary products with low maintenance needs can be especially ideal for the residential market, but other membrane bioreactor systems have mandatory chemical ‘clean-in-place’ (CIP) control for cleaning every two weeks.